Share A Paranormal Evening with Alice Cooper - if You dare! 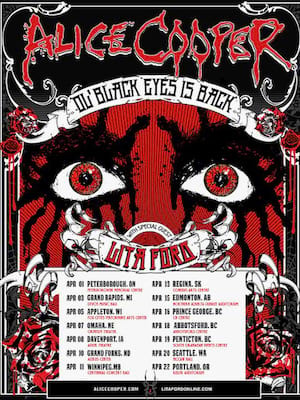 Legendary rocker Alice Cooper is hitting the road on a North American trek with his new tour "A Paranormal Evening with Alice Cooper". Touring in support of his of his 2017 album "Paranormal", (his 27th all-together!) he'll be joined by rock band Halestrom for this summer jaunt. But don't you worry, if we know Alice, there will be plenty of chilling, thrilling antics! 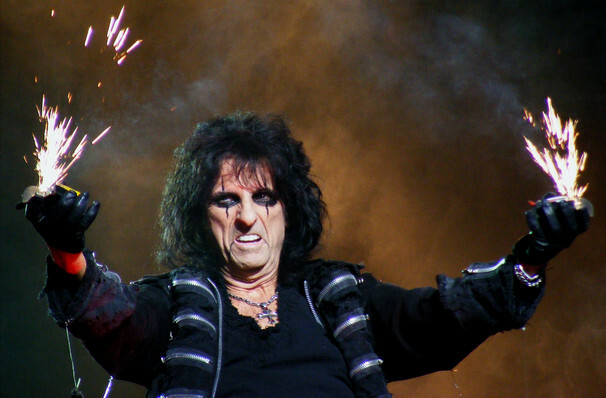 No one defined shock rock like Alice Cooper. Cooper used violent (and vile) theatrics - simulated executions, the chopping up of baby dolls, and draping himself with a live boa constrictor - and explicit lyrics to become a controversial yet hugely popular figure in the early-and-mid 1970s. He's mellowed a bit since then, becoming somewhat of an elder statesman of the rock world, with an enviable back catalog of hits including 'School's Out', 'Elected', No Mr. Nice Guy' and I'm Eighteen'. Without Alice Cooper, there might never have been the NY Dolls, KISS, Marilyn Manson, Nine Inch Nails, Motley Crue, Slipknot or Rob Zombie ... maybe not even David Bowie, or at least not Ziggy Stardust. About Providence Theater: We are an independent show guide not a venue or show. We sell primary, discount and resale tickets and prices may be above or below face value. Sound good to you? Share this page on social media and let your friends know about Alice Cooper at MGM Grand Theater. Please note: The term MGM Grand Theater and/or Alice Cooper as well as all associated graphics, logos, and/or other trademarks, tradenames or copyrights are the property of the MGM Grand Theater and/or Alice Cooper and are used herein for factual descriptive purposes only. We are in no way associated with or authorized by the MGM Grand Theater and/or Alice Cooper and neither that entity nor any of its affiliates have licensed or endorsed us to sell tickets, goods and or services in conjunction with their events.